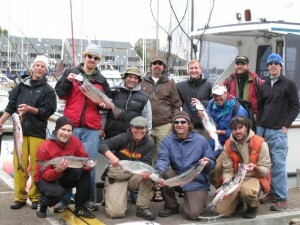 Treat yourself to a Salmon fishing charter trip originating at our slip between the Embarcadero Resort and The Landing which is located on the beautiful Yaquina Bay in Newport Oregon. We’ll take you to some of the best known places to catch a Coho Salmon such as the ‘ Rock Pile’ which is 11 miles off of South Beach. 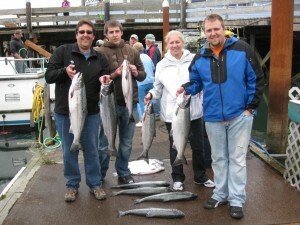 We’ll also go to some serious salmon run locations which are continuously watched and reported on by our charter boats. DESCRIPTION: The coho salmon is bluish-black with silver sides in saltwater; black spots on the back and upper part of the caudal fin. 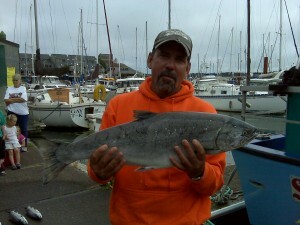 Smaller and slimmer than the Chinook salmon; the inside of the mouth is gray or black with white gums. Coho salmon reach up to 38.5 inches in length and weigh up to 31 pounds; although they usually weigh between 6 to 12 pounds. LIFE CYCLE: Spawning occurs from November to January, with the eggs hatching the following spring. Coho fry remain in streams for over a year. Moving seaward the following spring, most cohos return to spawn when they are three years old. The mature male fish which return after two years are known as “jacks” and in Oregon and Washington, the abundance of “jacks” are used to predict the next year’s three year old return. HABITAT AND ECOLOGY: Coho salmon utilize freshwater, near-shore and offshore environments during its life-cycles. Coho salmon spawn in the same environment as Chinook salmon; however, coho prefer lower stream velocity, shallower water and smaller gravel. Most coho fry stay in the stream for over a year feeding on aquatic insects, zoo plankton and small fish. Adequate stream cover is important to fry survival, as is high dissolved oxygen levels.Mortality is especially high during freshwater life stages, often a result of poor forest and agricultural management practices that lead to siltation, which may ruin spawning beds or smother the eggs. Migrating coho salmon also face physical obstacles and high water temperatures resulting from dams, inadequate water flows due to diversions for irrigation and impoundment of water for power generation. Once reaching the estuaries, coho salmon fall prey to a number of other species and may be impacted by human changes, such as shoreline development, residential drainage and the filling of marine wetlands. The time spent in this habitat is critical to the development of the species and their ability to survive in the offshore environment. RANGE: Coho salmon spawn in coastal streams from Northern Japan to the Anadyr River in Siberia and from Monterey Bay in California and Point Hope in Alaska. This species can also be found in the ocean from Baja, California, to the Bering Sea in Alaska. Major U.S. spawning grounds are in Alaska, Washington and Oregon.